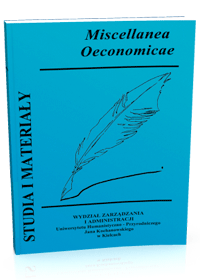 “Miscellanea Oeconomicae” is an academic journal, which has been published since 1996 by the Faculty of Law, Administration and Management of Jan Kochanowski University in Kielce. This volume Security and International Relations in the North is the fourth project of Miscellanea Oeconomicae written wholy in English. The aim of this book is to define current and future challenges and opportunities that involve broad sense of contemporary relations in the Northern Region. This paper will examine changing national and supranational approaches to security and defence, how and why interests and responses are diverging, the potential impact on policy and economic developments over the next few years, and to what extent there is a major and irreversible shift underway in security strategies. The volume consist of three part, which together include nineteen articles. The first part of this book is devoted to the international relations in the North, the second part – Security Dimensions in the North and third part – The Arctic in Political and Security Dimesions. I would like to thank the Editor-in-chief of Miscellanea Oeconomicae Professor Andrzej Szplit for His kindness and help in issuing this volume. Joanna Grzela, Security of Northern European States. Status Quo or New Architecture?